Above: My family: my father, Panagiotis; my brother, Spyros; myself; my brother, Simeon; and my mother, Kalliope. Above Right: Independence Day Celebrations (1963). 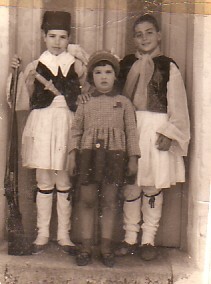 L-R: Alexandros and Vasiliki Americanos, and myself. Above: With my siblings, Simeon and Spyro. Above Right: On the bike with my friend, Elias. Above: End-of-year school activities. I am first from the left. Above Right: With friends outside the Athina Club, Sydney. L-R: myself, Tasos and Ignatios. Circa 1974.